Welcome to my book barn! The “Cowgirl Peg Book Series” currently includes seven entertaining books. The first six titles are written at an elementary level, but enjoyed by readers of all ages. The new, seventh book is a chapter book written for higher elementary through adult reading levels. I built the series by combining my love of horses and dogs with powerful character-building messages. Beautifully illustrated by artist Pat Wiles, the books are nationally endorsed and highly recommended by parents, young readers, educators and counselors. Leaving a positive impact in the lives of thousands of young “Cowgirl Peg” fans is the biggest reward of all! The characters in each of the following titles are real! 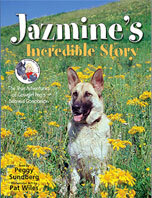 Actual photos of myself as “Cowgirl Peg”, plus the animals in the stories, are included at the end of each book. used nationally in “Red Ribbon” Drug Awareness school programs. young city girl with dreams of becoming a cowgirl. ranch where her dream comes true. Shortstuff Bucks! arrived in 2005 as my third book. with humor, suspense and awesome artwork. themselves” when facing challenges and adversity. continuous, subtle message that “animals have feelings, too”. 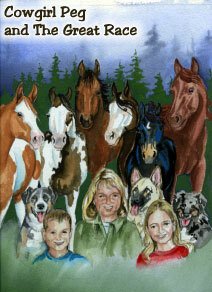 is filled with imaginative dialogue between Cowgirl Peg and her horses. and Muffin share a humorous adventure at the ranch. of physical exercise and healthy eating along with teamwork. It is a beautiful, entertaining book for kids and grown-ups of all ages! that is nominated for a national award. Cowgirl Peg's school wardrobe is proudly donated by Wrangler.